Is the federal government usurping states' powers? Arizona enacted Medicaid cuts early this year only to have the action countermanded by the Obama administration's recently passed health care law. 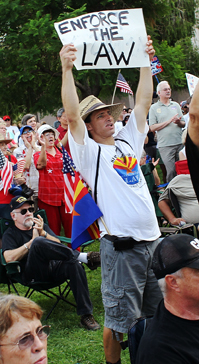 Arizona is now one of 20 states challenging the new law as unconstitutional. Meanwhile, the state is also tangling with the federal government over national immigration policy. The cases highlight the recurrence of high-profile clashes over federal power and state prerogatives playing out against the backdrop of sharp political attacks on the administration and declining confidence in government at all levels. One federal judge has upheld the new health care law, but the states' suits challenging the law are advancing. Meanwhile, the Supreme Court is set to hear a challenge by business and civil rights groups to Arizona's tough law on hiring illegal aliens even as the state is appealing a lower court ruling that blocks its new measure requiring local law enforcement officers to check the immigration status of anyone arrested, detained or stopped for possible law violations.